Well, a new year is upon us, but fear not, I'm going to persevere with the same old tired nonsense here at Kirk's Movie Blog. It was a pretty quiet week, film-wise - I've been away visiting family and friends over the Christmas period, so only had time to catch a couple of movies this week. Normal service will be resumed next week. This recent British Indie film is a coming of age tale, telling the story of David and Emily, two teenagers who have grown up together at a camp site in Norfolk. When Emily's father wins a custody suit, and it looks like she is going to have to move away, the pair come up with a plan so that they can stay together for the summer. Emily will hide out in a cave at a nearby beach, with David bringing her supplies and keeping her company whenever possible. Unfortunately, the execution of this simple plan leads to tragedy - Emily's disappearance sparks a local manhunt, with David's lies to the authorities and parents begin to catch up with him. This was a film which has quite a lot going for it, particularly the acting of the two young actors in the lead roles, Thomas Turgoose and Holliday Grainger. I've seen 'Thomo' in around four films and TV shows to date, and I don't think he's ever put in a weak performance. He's definitely one to look out for in the future. Another positive is the cinematography, which includes some beautiful shots of the Norfolk coastline, and a visually arresting sequence at the start of the picture, in which David and Emily jump from the roofs of rows of caravans in the holiday park. Despite all of those plus points, I was rather disappointed by the way the film ended, which I felt took the film into an unneccesarily cruel direction. It's not that I'm averse to an unhappy ending per se, but I felt that the way in which David acted in the climatic scenes were not consistent with the character which had been established in the first two thirds of the movie. Nevertheless, it's a promising debut from director Tom Harper and definitely the finest film I've seen set in a Norfolk holiday camp. 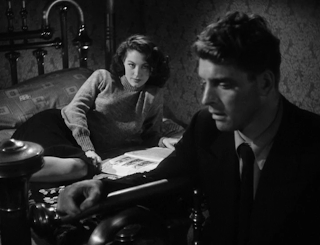 This is a brilliant film noir, starring Burt Lancaster as a washed up former boxer who is double crossed by a beautiful femme fatale played by Ava Gardner. The movie grabs you from the opening scene, adaptated from the Ernest Hemingway short story of the same name - two cold, arrogant contract killers walk into a diner in a small town in New Jersey, order a dinner of ham and eggs and begin menacing its staff and patrons. What follows next is even more extraordinary, as Burt Lancaster's character, Ole 'the Swede' Andreson, is warned of the killers' presence, yet decides to stay put and await his death at the hands of those two assassins. It is only down to the efforts of Jim Riordan, an relentless insurance invesigator played by Edmond O'Brien, that the truth comes to light. For me, this one is up there with the very best in the genre, comparable to the likes of Double Indemnity, Kiss Me Deadly and The Maltese Falcon. I really liked the film's rather unusual structure; Andreson's tale of woe is told in flashbacks as Riordan talks to the various people in the Swede's life, who are to provide parts of the story from their perspective. It features an excellent cast, with some of Hollywood's most iconic stars in their prime, some very sharp and witty dialogue, a prize fight, a heist, and a plot which keeps you guessing until the final scene. Thoroughly recommended.